I spent this afternoon on a guided street food tour of Tijuana. Starting at the Blue Line trolley stop near my Airbnb, I took a ~45 minute ride to the last stop on the line at San Ysidro. The trolley stop is a stone’s throw from the border between the US and Mexico. 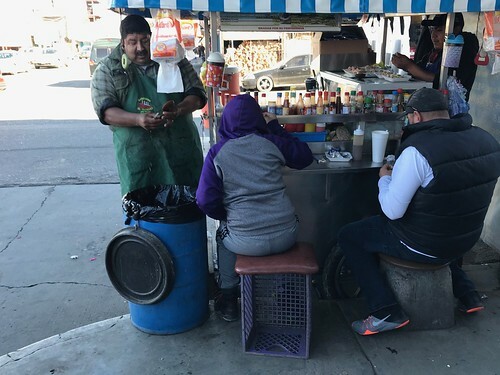 I’d signed up for the Wild Foodie Tours Tijuana street food tour based on many positive online reviews. As it turned out our guide Albert is the one man operation behind the company. He’s a self-described foodie who comes from a restaurant family. 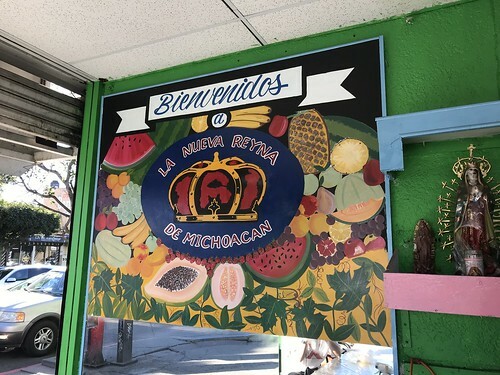 The tour I’m about to describe is my experience only; this tour varies depending on what’s available on Tijuana’s street food scene. I should also point out I’ve commented on Mexico’s excellent street food scene before during my visit to Mexico City in 2011. The tour started — ironically enough — just outside a McDonald’s at the border. You can’t miss the location if you take the trolley since it’s at the trolley platform. Albert guided us through Mexico’s customs. On foot it’s not super obvious where to go, but once you’re inside you get a passport stamp, they scan your bags, and that’s about it. Aside from the guide our group included myself from California, two people from New Jersey, and a family from New Zealand. The last group took a little longer but I think the total time was probably under ten minutes. It’s not like the old days where people could apparently just walk into Mexico, but it’s still pretty fast. On the other side of the border we walked over to a shared taxi stop. If you’re unfamiliar with Mexico’s transit this might be a little confusing. In American English we call a shared taxi a “jitney”, but I doubt many Americans are familiar with the term. It’s kind of like public transit in that it’s cheap and shared, but it’s not strictly official. 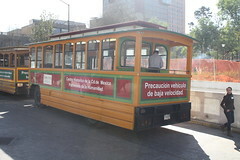 Even if you speak Spanish I’d recommend a local guide for this mode of transit. Our first stop was a semi-open air farmer’s market, Mercado M. Hidalgo. It’s a super crowded and not particularly tourist friendly market where you can find everything from fruits and vegetables to religious figurines and pinatas. I had to keep dodging people and ducking in order to follow our group around the place. Early on our guide got a large fruta con chile to share for the group. This is a simple, classic Mexican snack: it’s a bunch of big wedges of fruit (melons, jicama, etc.) dusted with chili powder. The sweet juicy fruits combined with the spices combine in your mouth to explode with a strange sensation of burning sweetness. 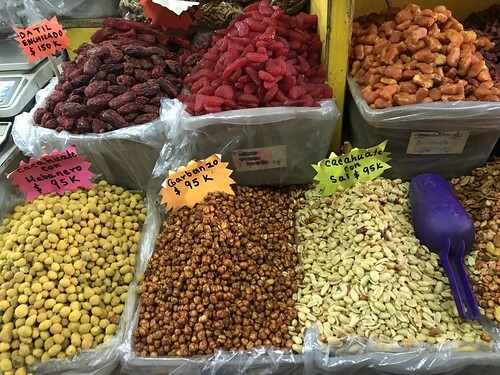 We stopped at the market to sample a variety of foods available for purchase, the highlight for me was a shop selling spiced nuts and dried fruits. I wish I’d bought some of the spiced peanuts but I also know I’d have wolfed them all down by now. The next stop was a food truck well known among locals and had a small crowd. We got fish tacos that took a while to prepare, but were outstanding. 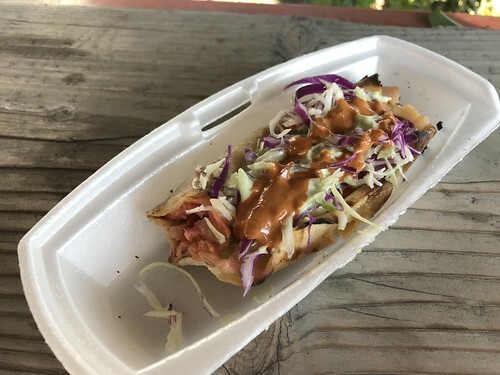 I’ve never had anything quite like it — the soft shell tacos were crunchy and grilled on the outside, but soft on the inside. This was by far the highlight of the tour for me. Fish tacos are a classic Californian dish, but this variation blew me away. The younger member of the New Jersey group confessed this was the best fish taco she’d ever had, and I couldn’t disagree. On the way to the next stop one member of our group pointed out that the top of a fire hydrant seemed to be sticking out from the sidewalk. Albert brushed this off replying with “a lot of what you’ll see in Mexico makes no sense.” Words to live by. Next we wandered over to a street food vendor offering a variety of seafood dishes. We got their ceviche, which was good though it seemed like a step down from the previous tacos. Then again almost anything would seem like a step down from those delicious tacos. Some of the other seafood dishes they offered seemed more interesting, including a raw clam dish. One person in the group wanted to try it, but our guide warned them it would be very filling and spoil their appetite for the rest of the tour. 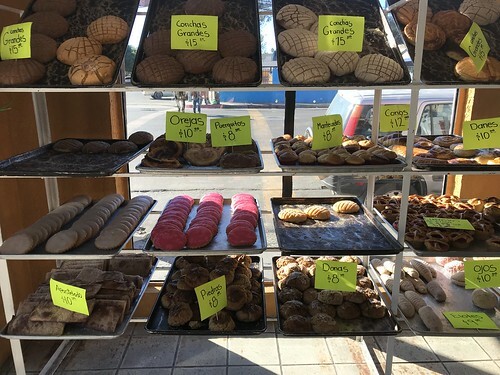 Although not part of the tour exactly, we went to a traditional Mexican bakery for those interested in purchasing classic Mexican sweet pastries and cookies. Apparently California’s food import laws allow baked goods to be brought in. They’re much pickier about fruits, however. But fruits in baked goods are okay. We made a brief stop at a corner taco stand serving carne asada tacos. As a pescatarian I had a bean taco which was fine, especially after adding various toppings including extremely spicy salsa and grilled onions. The best part was the tortilla, handmade to order right there at the taco stand as we watched. We had a much longer stop at an indoor juice shop for agua frescas and horchata. 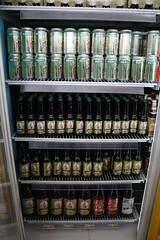 The owner’s daughter served the beverages for us, she was barely tall enough to reach over the refrigerators. My horchata was excellent. Aside from the bakery this was the only stop that I guess isn’t technically street food, though the sides of the store were open to the sidewalk. This stop offered a nice chance to sit at some makeshift tables and chairs and chat for a bit while watching the people, cars, and taxi buses pass by. Albert told us about some of the other tours he offers, including one to Caesars, the Tijuana restaurant that invented the Caesar salad. The guy gets around, he says he’s going to have some completely new food tours just days away in 2019. As we sat at the corner juice spot one person in the group pointed out how Mexico’s stoplights work differently — before switching to yellow, the green light starts flashing. At the same time the walk signal starts flashing as well, before switching to a solid red hand. I’d noticed this as well. Some of the pedestrian signals have countdown timers, but they often aren’t hooked up correctly. (Many just flash “88.”) This hardly matters since Mexican drivers treat stop lights as suggestions rather than rules so you have to be careful and cross your fingers as you cross the street. The father of the New Zealander in the group told me he thought California drivers were overly polite and was more used to haphazard way people drive in Mexico. He claimed it’s due to some weird quirk in New Zealand’s law where car insurance is partially government subsidized so there’s less personal incentive to avoid collisions. Our last major food break was another taco stand, a big street food operation that attracted quite a crowd. At this point I was super stuffed and could only finish off one of the two fried fish and seasoned sour cream tacos. Two police officers were taking their time at their lunch break as we ate. They hogged the salsa stand perched on an outdoor windowsill. Strangely this street food stand had a storefront across the sidewalk they used for storing ingredients and such. Seemed to me they could have just operated out of there? Then again they were clearly successful operating just off the sidewalk so who am I to argue. Aside from fish tacos this vendor also specialized in a seafood soup. That might have been a better option at this spot but it was interesting watching the guy operating the fryer, tossing breaded fish into a huge vat of oil for the fried fish tacos. The last food stop crossed the ultra-touristy Avenida Revolucion to a vendor offering churros. Don’t get me wrong, a freshly fried churro is great; but it also seemed anti-climactic for a food tour. Then again I was far more used to Mexican food than most of the participants in the group, being the only Californian. 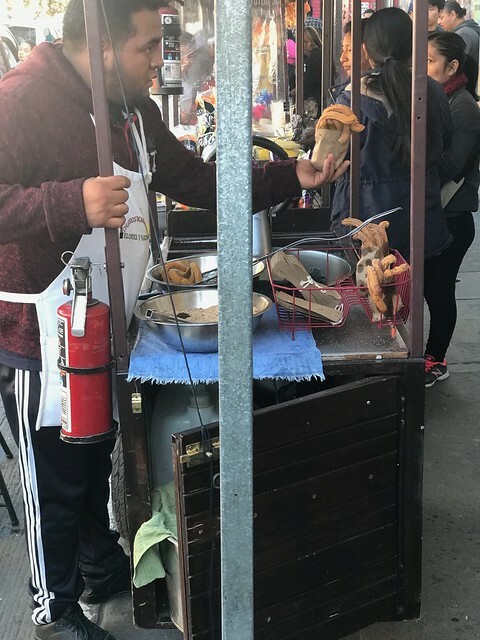 The vendor made each churro by extruding the dough from a device built into the cart by cranking what looked like a steering wheel before dipping it in the fryer. These were very small, thin churros sold in a small paper bag like french fries. And I have to say they were delicious. On the opposite side of the sidewalk a store was selling shoes… and mobile phones. 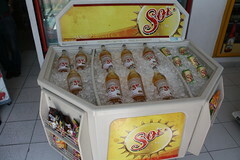 Only in Mexico! At the end Albert took us on a on a shared taxi back to the border and instructed us where to go. He said he’d stay the night in Tijuana as we all passed customs back into the US. 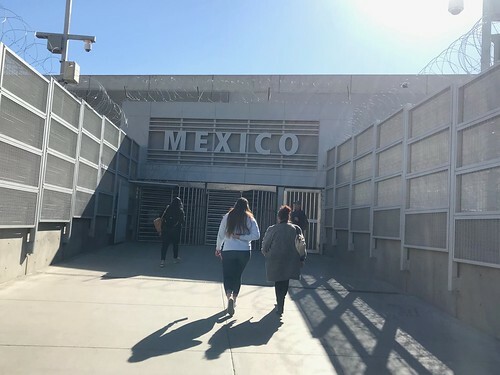 Entering the US on foot from Tijuana was very quick. There was no special line for US citizens. One of the New Zealanders made it across before I did, and we wished one another a happy new year before I had to literally run to catch the Blue Line trolley back to downtown San Diego. You can make creme brulee or pizza on the street corner and call it street food. But while it might be tasty, it’s still not street food — it’s just kitchen food made in an uncomfortable outdoor setting. 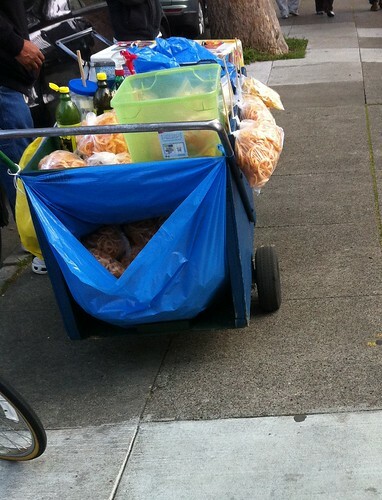 On the other hand, a cart filled with chicharrónes in plastic bags, with various flavorings? Now THAT is street food. It’s authentic, it’s cheap, and it’s good. But it’s not gourmet restaurant food, and it doesn’t pretend to be. This food cart would have fit right in down in Mexico City. It makes one realize what a shame it is that we don’t have folks selling homemade sorbet on street corners here in SF. 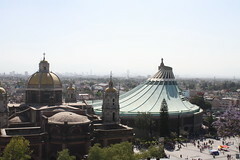 This is part of a series about my trip to Mexico City and the surrounding area. Also see part 1, part 2 and part 3. 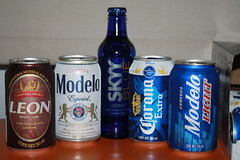 There’s cultural differences between Mexico and the United States that surprised me during my recent visit. There were pleasant surprises, and not-so pleasant surprises. Let’s explore them all. 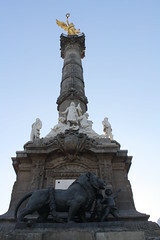 Mexico City is in many ways a world-class major city. Good restaurants, hotels, street food, and the entire place is huge and packed with people and businesses. They have easily the best public transit I’ve ever seen, with a Metro where trains are spaced less than two minutes apart, bus rapid transit, electric trolleys, as well as traditional buses. (Traditional buses in Mexico are independently operated, sort of like shared taxis with pre-planned routes.) I never got to try the bicycle sharing program, but it looked like something to try. 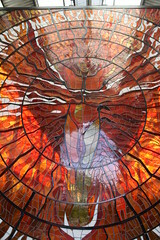 It’s also a beautiful city with art everywhere. They’re big on statues. Certain parts of the city are very walkable, with pedestrian streets. 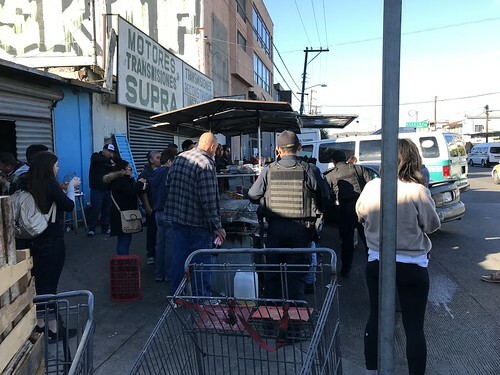 I’m told safety is an issue, but I never really saw any crime; of course, I was traveling with Mexicans who knew the country much better than I did and were aware of which areas to steer clear from. The police in Mexico City often have automatic weapons. They seem to mainly patrol tourist areas, which is nice if you’re a tourist but I’m sure is infuriating if you’re a local. Some of the things surprised me not so much as an American, but as a San Franciscan. Sidewalk vendors seem to have free reign in terms of the space they take up and what they do. Street food was everywhere and often delicious. I can safely say I had better Mexican food in a Toluca parking lot than anywhere else, ever. One guy was selling homemade sorbet right outside of an elementary school, a concept that would make American parents’ jaws drop. Now all this said, there’s a few big issues that Mexico needs to address, the sooner the better. We take it for granted in the US that we can walk into almost any store without surrendering our bags to the front desk. In Mexico, this is unheard of. In most stores, everything is either sold from behind the counter, or you have to check your bags before they let you go in. (Why I’m supposed to trust someone who makes $3 a day with a $500 camera was never explained to me.) 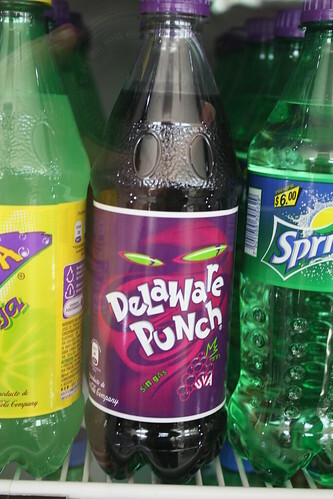 There were exceptions to this, but they were mostly convenience stores or stores swarming with security guards. One store even had security guards standing on stools to watch over everyone. Another store insisted on putting cable ties on the zippers on my backpack so it couldn’t be opened. But the lack of trust extends much further than shopping. Most homes in and around Mexico City are small buildings made from cinder blocks. They line the edges of the roofs and balconies with broken glass, sort of a cheap alternative to barbed wire. The outside of these homes is almost never painted, because to paint your home would suggest that you have money, which would be like putting up a “Please rob my house” sign. It’s hard to imagine why everyone is treated like a criminal. I’m sure there’s a good reason for it (i.e. lots of crime) but unless you’re used to this sort of treatment, it’s damn insulting. 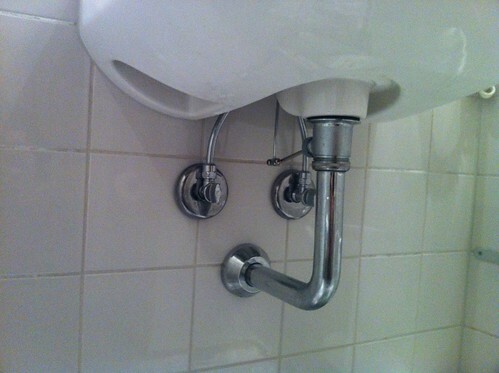 It’s funny, but I thought the worst plumbing I’d ever have to deal with was in my trip to Greece. There, toilets simply couldn’t handle toilet paper. I was told many toilets in Mexico had the same problem. But in my entire visit to Mexico, I never had a problem with flushing TP. 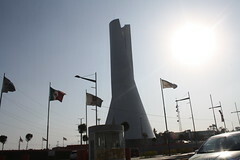 Someone from the Mexican tourism bureau needs to get a team of plumbers together and go around fixing this ASAP. Another issue which may or may not be related is the foul-smelling rivers! This was especially noticeable in Toluca, where a river a couple blocks away from our hotel smelled so bad that I was able to smell it inside hotel, even in spite of having a stuffy nose due to my cold. I think part of this is related to the lack of trust (described above) but there’s also an issue of just not caring or trying very hard. It’s not like Greece, where everybody moved too slow. This was something much worse about Mexican customer service that was hard to pin down. On many occasions, when asking for help finding something at a store, they were simply unwilling to help. I found this not only to be bad service, but also generally rude. The aforementioned bag-check at many stores as not only an insult, it was a hassle as well. Larger stores tended to have long, slow moving lines. There wasn’t any rush to get people through the checkout. We went to extend our stay at the first hotel we were at, but they insisted we had to pay 700 pesos ($70 USD) per night instead of the 350 pesos ($35 USD) we had bought the original two nights for via Kayak.com. They said it was fine though if we wanted to order online to get the discount. So we did that, and then they told us we’d need to print out the e-mail confirmation, and “no you can’t use our printer.” Would it have been that hard for them to explain that we would need to print the e-mail BEFORE we placed the order? It would have saved about 20 minutes, and wouldn’t have been hard to explain in the first place. One more example: a cashier at a drink stand refused my 100 peso ($10 USD) note for a bottle of water that cost 10 pesos ($1 USD). She claimed she didn’t have change. I didn’t buy anything there, including the cashier’s lame excuse for laziness. Granted, this wasn’t true everywhere. But for the most part, I really got the impression that everyone who worked for someone else was doing the bare minimum necessary to keep their jobs. 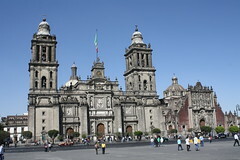 Were it not for the fact that I was visiting my girlfriend’s family — who were all very nice to me — I would have been under the impression that most Mexicans were lazy, self-centered assholes. Overall, I’m a little torn on whether I’d go back to Mexico or not. On the one hand there’s still a lot more to see and do. I need to finish climbing the pyramids! But on the other hand, between the problematic customer service, the stench, and the way everyone is treated like a criminal, it’s a bit hard to justify returning. I hate to say this, but perhaps the deciding factor is the price; Mexico is a cheap place to go, and it’s close enough to the United States that traveling there is inexpensive as well. Round trip airfare was less than $200 (USD) per person even after taxes and fees, rides on the Mexico City Metro were 3 pesos ($0.30 USD!! ), and there’s excellent food for mere dollars. So yeah, I’ll be back in Mexico someday. But it’s not at the top of my list. 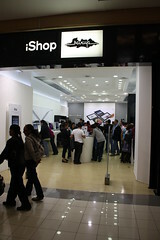 This is part of a series about my trip to Mexico City and the surrounding area. Also see part 1, part 2, and part 4. We spent four days in Toluca, and unfortunately I was ill the entire time. Since it was kind of a blur for me I’m cramming the entire four days into a single entry. 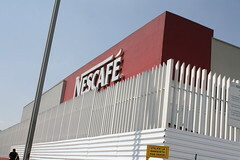 Toluca is largely an industrial town, with production outposts for Nestle, Coca-Cola, Chrysler, and Cuauhtémoc Moctezuma (the brewery that makes Tecate, Sol, Indio, and Dos Equis.) Due to the manufacturing, there’s also a lot of hotels, restaurants, strip clubs, etc. We hitched a ride on a taxi, then took a bus, where we met up with Alexia’s cousin in Toluca. We spent the evening checking out Metepec, an old town nearby which houses several old churches and a district of local artists. 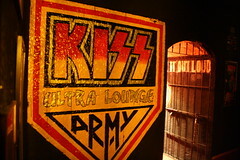 Later in the night we joined up with the rest of the crew and went to the KISS Lounge. 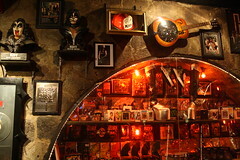 It’s a basement bar that doubles as a shrine to the band KISS. 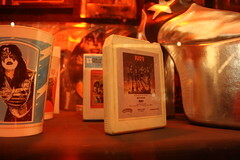 The decorations are all merchandise and albums from the band. 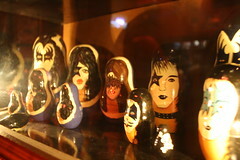 Most of the bar’s walls were stuffed with KISS memorabilia behind glass; perhaps most shockingly, their collection included two separate matryoshka sets painted to look like members of KISS. As if one set was not more than enough? Late into the night, a live band showed up to play various hard rock covers. By “late” I mean really late; the bar closes at 5am. The second day was pretty mellow, we hit up a “VIP” movie theater to see Black Swan. If you weren’t aware, a VIP movie theater has reclining Lazy-Boy style seats, tables, and waiters who will bring alcoholic drinks to your seat. This begs the question: why don’t we have this in San Francisco? I’d be there every week. 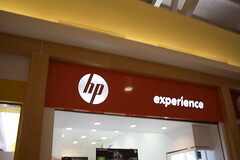 Anyway, the mall with the VIP theater had some unusual stores; a Hewlett Packard store, an “iShop” Apple Store knockoff, and they had an Imaginarium! This was the toy store I grew up with, and just like I remember, they had regular doorway next to a child-sized doorway. Granted, it wasn’t nearly as large or fancy as the one we used to have at the Stanford Shopping Center, but it was still a shock to me personally. 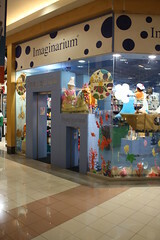 I had no idea Imaginarium still existed. 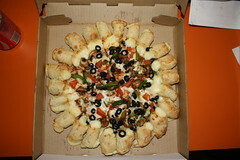 Later that night we had one of Pizza Hut’s bizarre pizzas delivered to the hotel, and watched some Mexican TV. 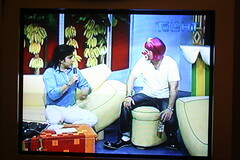 You know you’re watching Mexican TV when a guy in a clown suit is being interviewed by a woman sitting on a banana-shaped sofa which is in front of a wall that has bananas hanging from it. 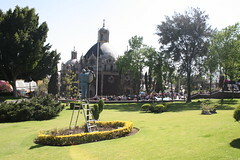 We headed back to Metepec to check out the local shops, then hitched a bus back to downtown Toluca. On the way, a band jumped on the bus to play some heavily-accented Doors covers. 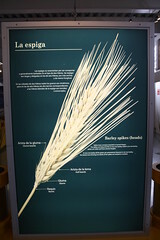 Back in Toluca, we went to the MUMCI, a museum dedicated to beer brewing sponsored by Modelo. For homebrewers it’s quite interesting, and fortunately it’s in both English and Spanish. 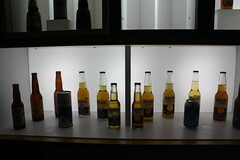 They cover everything from growing crops to brewing to bottling and packaging. They even have information on building your own industrial-grade brewery, which seems a bit odd as they’re explaining how you can compete with them. 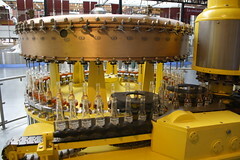 It even includes a Star Tours-esque ride about the bottling process. 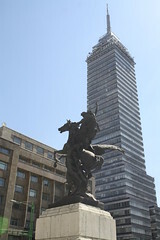 In downtown Toluca, I found that this vacation had something in common with my trip to Greece: the Acropolis. 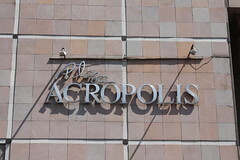 But unlike the Greek version, Toluca’s doesn’t cost 12 Euros, and it’s a mall. 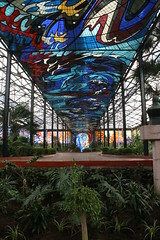 We headed to the Cosmovitral, a plant conservatory in a green house that’s covered in an absurd amount of stained glass. 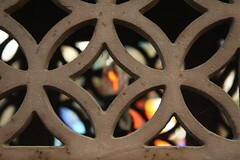 In fact, it was worth the entry fee alone just to look at the stained glass, let alone the plants. 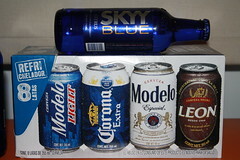 At the end of the day we retired to our hotel room with a box of mixed Modelo cervezas and a Skyy Blue cocktail (made with real Skyy vodka, unlike its American counterpart) from the local convenience store. 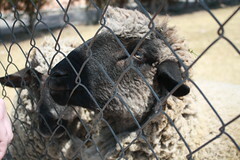 The final day before my departure, we met Alexia’s family’s sheep. Their job is to mow the grass at the family’s parking lot. We drove around to see some of Toluca’s factories, then to the official Cervefrio (or “beer store”) of Cuauhtémoc Moctezuma where I bought a official Sol beer mug. Just before my flight, I got a horrible stomach ache because of my cold. Alexia’s aunt gave me a glass of some kind of incredibly foul tasting home remedy which worked surprisingly well. Whatever it was, it made me well enough to get on the airplane. Well, almost… as it turns out when your sinuses are completely clogged you should not under any circumstance get on a airplane. That’s something I learned the hard way. 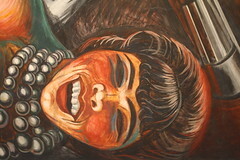 This is part of a series about my trip to Mexico City and the surrounding area. Also see part 1, part 3, and part 4. We met up with more of Alexia’s family and we headed down to a massive bus terminal to for a ride to the pyramids of Teotihuacan! On the way I was introduced to the concept of legal graffiti. 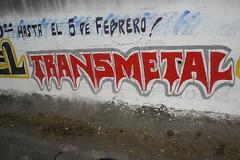 Bands often pay to have legal graffiti billboards of sorts painted on public walls to advertise their shows. 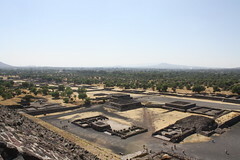 The Teotihuacan pyramids were overrun by “gypsy” style merchants of sorts selling whistles, hats, jewelry, etc. We headed down to the first and smallest pyramid, then quickly realized we needed a guide. We found a guy who spoke a bit of English (this was for my benefit only.) 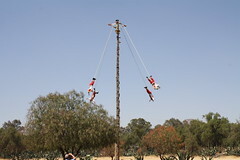 Before showing us the pyramids, he pointed out a group of four traditional Voladores de Papantla, or acrobats who were swinging in a circle off ropes on a 16 meter tall poll on ropes tied to their ankles. 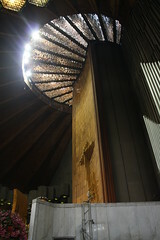 He claimed that traditionally, the poles were 40 meters high. Not for those of us with a fear of heights. The tour guide (guy in the black baseball cap in the photo) showed us some traditional dyes made from insect eggs, paper, thread and needles made from cactus, and most surprisingly, the way the old city of Teotihuacan had been built. According to our guide, every 52 years the citizens created a new city on top of the old city. So far archaeologists have only dared to go one level deep, where they found an earlier foundation for the buildings in exactly the same place, but with different decorations. There’s only one visible spot where it’s been dug up, and it’s pretty incredible. So far nobody knows if there’s another level deeper. Mysterious! 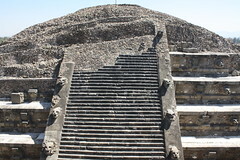 After an hour or so, our tour guide left and wished us well, and we decided to go up the Pyramid of the Sun, which is the largest pyramid at the site. Here, I have to admit that I didn’t make it even halfway up, perhaps because of the already high elevation, or perhaps because I was coming down with a really bad cold that would haunt the rest of the trip. I hate to admit that I was defeated by this pyramid — especially because it was one of the main reasons I came to Mexico in the first place. The one saving grace was that the view from partway up was incredible. 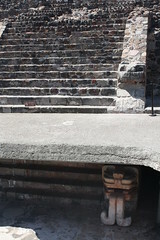 You could see the entire ruins of Teotihuacan from there. While everyone else finished scaling the pyramid, Alexia and I headed across the way to a small strip with some restaurants. Upon entering the street, we were assaulted by six young men carrying menus, each insisting we eat at the restaurant they represented. All of the restaurants essentially had the tourist-esque “please everyone” massive menus, so we decided on the restaurant we’d been recommended earlier. Eventually we were joined by our companions. We ordered micheladas. 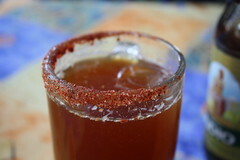 If you’re not familiar with a michelada, it’s a Mexican beer (in this case, Indio) mixed with lime juice, Worcestershire sauce, and Clamato in a glass lined with salt and chile pequin. It’s one of my favorite cocktails, basically a Mexican version of a bloody mary. If you haven’t tried it you’re missing out. 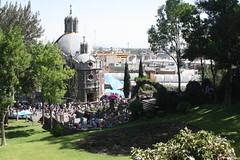 On the fourth day we took the Metro to Basilica of Our Lady of Guadalupe, the world’s most visited Catholic shrine. It’s a lot like Disneyland except there’s no rides and you have to pay to use the bathroom. 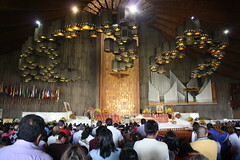 The main cathedral on the site was built in the mid 1970′s. 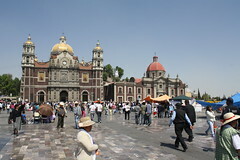 It contains an incredibly large church, a place to put flowers, a series of conveyor belts you can stand on while looking at a painting of the Virgin Mary, and (of course) a gift shop. From the outside, the building looks suspiciously like Space Mountain, but the closest thing to a roller coaster is the Virgin Mary’s conveyor belt. 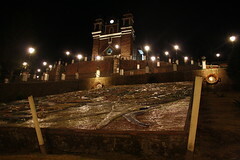 The grounds of the basilica contain several smaller chapels, Pope John Paul’s Popemobile(TM) and the old basilica, which is now fenced off due to problems with its structural integrity. The gardens have a bit of a mini-golf vibe, with a number of uncharacteristically painted statues here and there, and a few fountains. 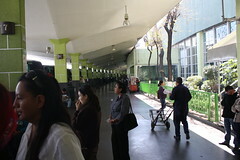 In the back there’s a cafeteria area with tortas, soda, etc. 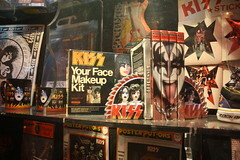 And (of course) more gift shops. The area around the church seemed a bit sketchy… definitely not the kind of place you’d want to be at night. And perhaps even dangerous during the day, as Alexia almost stepped on a snake. Hey everyone, gather ’round the living room and take a nap while I subject you to my vacation slides from February 2011, when Alexia Anthem and I went to visit Mexico. In spite of taking a redeye flight and essentially not sleeping at all, Alexia and I somehow found the energy to not flop down on the comfortable hotel bed and sleep. 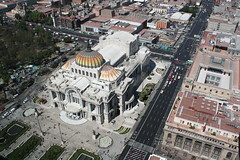 Instead, we walked from our hotel to the park and the Palacio de Bellas Artes. Unfortunately the Bellas Artes was closed, so we headed to the nearby LatinoAmericana tower to check out the view and generally be good tourists. After coming down from the tower, we headed down the street to the Zócalo, a plaza with a bunch of government buildings, a cathedral, and a surprisingly large flag. Somehow we stumbled our way to a Metro stop. The Mexico City Metro is a rubber-tire train system that’s dirt cheap (tickets are 30 cents USD) and trains come every two minutes. It’s very impressive compared to what we have in San Francisco. Plus they have food stands in the stations, including Domino’s. How cool is that? A few hundred staircases later we ended up walking down an alley filled with little shops and restaurants and on the way to Paseo de la Reforma, the main drag in Mexico City. 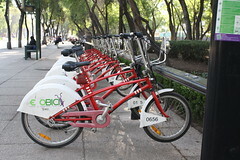 Along La Reforma, there’s dozens of bike racks used as part of a bike-sharing program. 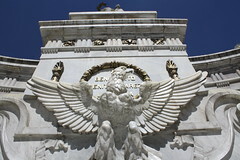 Soon we found our way to El Ángel, the iconic golden angel statue seen on Mexico City memorabilia everywhere. The statue is in the middle of a traffic circle. If you weren’t aware of this, jaywalking is somewhat of a national pastime in Mexico. So they didn’t bother with crosswalks to get to the angel, despite it being a national monument. You pretty much have to close your eyes, cross your fingers, and run through traffic to get to it. 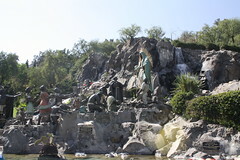 There’s a bunch of statues at the base of the angel, and a little door with some tombs inside. Protip: if you plan your vacation better than we did, there are days than you can go up inside pillar that holds the angel to an observation deck above. 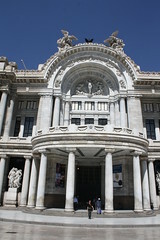 We were joined by Alexia Anthem’s cousin, and finally got to go inside Bellas Artes. The place is free, unless you have a camera, in which case they charge a camera fee. Yeah, I know. Lame. 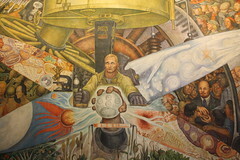 Anyway the place is filled with fantastic murals, including some of Diego Rivera’s best. 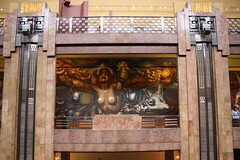 A strange thing about Bellas Artes is that the outside has a typical Roman look, but the inside is art deco. The contrast between old and new is sort of like a grandfather who snowboards and plays video games. 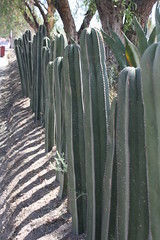 We took a walk down to the tequila museum, which unfortunately wasn’t open! I suspect it was because they had an infestation of mariachi on the patio outside and were waiting for an exterminator. On the way there, I spotted a fake cable car, which begs the question: is there a way to take it all the way from Mexico City to Fisherman’s Wharf?